A good way to announce yourself to the Texas music scene is to have every big name artist vouch for your new project. When the project blows away any type of expectations, it is a way to make sure you gain lifelong fans. Humble Folks is an instant classic follow-up to "Come May". With a #1 single, "One I Want," off the record and songs that evoke emotions, no matter what your walk of life is (Tall City Blues, Coyote. Stompin Grounds), this album is easily one of the best of 2016. Cleto Cordero's songwriting and story-telling help paint a picture in your mind as you listen to each song. I have yet to listen to the album and skip a song along the way. Seven years into his career, traveling the road and playing sold out shows, with some of the rowdiest fans were all highlighted on this live recording from Texas' oldest dance hall. Running through a boat load of crowd favorites, songs for members of his family, and throwing in classic lyrics made for a great journey through a night in Gruene. "Dead or In Jail", "Hangin Around" and "Creek Don't Rise" start the party early. But when WCG and company launch into She Likes the Beatles we're reaching the climax. The way Jack Ingram comes out and speaks of Will with a bit of reverence lets listeners know that he is the real deal. A definite all-timer as far as live albums go, WCG's LaGH will be talked about among the best recordings at a dance hall with a very storied history. Remember The Alamo! When you've followed an artist from the first time you saw them live, you get an attachment. The countdown to Breathless was driving me crazy until the album went live on iTunes. Once it did, it stayed in constant for a few months. As the record closes out, the last 4 songs might be one of the best run of 4 on any album I have ever heard. "High on a Country Song", his current radio single, has that summer time party feel, but as a winter single is perfect for coming home for the holidays and linking up with old friends. "To Save Something You Love", "One More Chance to Stay" and "Second Hand Smoke's" acoustic version close out the record while pulling at every emotion of broken hearts and lost relationships. For some, thats not what they look for in a country song... But for me, thats what makes me love albums even more. Rarely can a Sean McConnell record not strike a chord with you. His latest self-titled record flows smoothly from start to finish. Being 10 songs and clocking in at 37 minutes might make this one of the shorter records on my list, but as with anything, it's always about the quality vs quantity. "Queen of St Mary's Choir" and "Holy Days" were released first and stand among the stellar cuts. But album cuts define Sean's career. "Beautiful Rose" and "Babylon" are two of my favorites. Including one song from The B Side Sessions was a welcome addition to an amazing album. This may not make most "of 2016" lists. This isn't even a full length album, but six songs of straight in your face musical talent is hard to ignore. A group of 4 guys, two of which are Tejano royalty, all of whom could lead their own band, the Bandoleros came with it on their first offering. Guitar heavy with some hints of accordion, and 4 part harmonies make this such a great album. I don't think they have a true defined lead singer, and that's probably the best thing. "Get Down" is the party anthem on the record, but "I Don’t Want to Know" is one of the best put together songs of the entire year. The intro of the song sounds like its right out of a Robert Rodriguez film. Jerry has a haunting voice that is paired perfectly with Diego's as they trade verses on the track. Look for their full length soon, I hope! “Walkabout” has left a bittersweet taste for all Dolly Shine fans, as it became the last album released by the band. Thankfully, they left us with a beautiful treasure. This album demonstrated the growth of the band and the ability to work together to make the songs effortlessly shift between country, to blues, to rock. All while bringing life to their stories of outlaw drifters to heartbreak stories. Dolly Shine had the potential to be one of the greats, but whatever the reason it may be for their separation, I look forward to seeing what projects may emerge from these individually talented guys. With a soulful voice and honest lyrics Aaron Einhouse tugs at our emotions with his album “It Aint Pretty”. Like many artists Aaron took personal emotions and turned them into songs that reminds us that life consists of heartbreaks, hard work, and the need of wisdom to get through it all. In “It Aint Pretty” Aaron really plays with that fine line between Rock and roll and country music. Now, Ive never seen Aaron Einhouse perform live, but I love how listening to the album is almost as if I were seeing them on stage. This is definitely one of those albums that is good for every emotion, whether I want to stay in my car and cry- “Thinking of You” - or if I want to get up and dance and enjoy sometime hanging out with friends - “Dancin”. My favorite and without a doubt one of the bests albums of 2016 is the solo album of BJ Barham, Rockingham. Truth is, very few song writers and artists can transport us to a location, make us feel something that we have never experienced, and make us fall in love with people we have never met. Yet is exactly what BJ was able to accomplish in his album. He captivates us with his stories from start to finish, making it an album that we want to play on repeat for days. Among my favorite songs you will find “Madeline”, it is not your typical father-daughter song filled with “cute phrases” but rather an honest song about a father giving advice about life, relationships, and individuality to his baby girl. What makes it more amazing is that yes, these words are heartfelt and genuine but BJ does not have a daughter, to be able to put into a song those words of advice you one day hope to give your daughter is pretty freakin' cool. For an artist originally from Memphis, Tennessee this album is every bit Texas influenced. 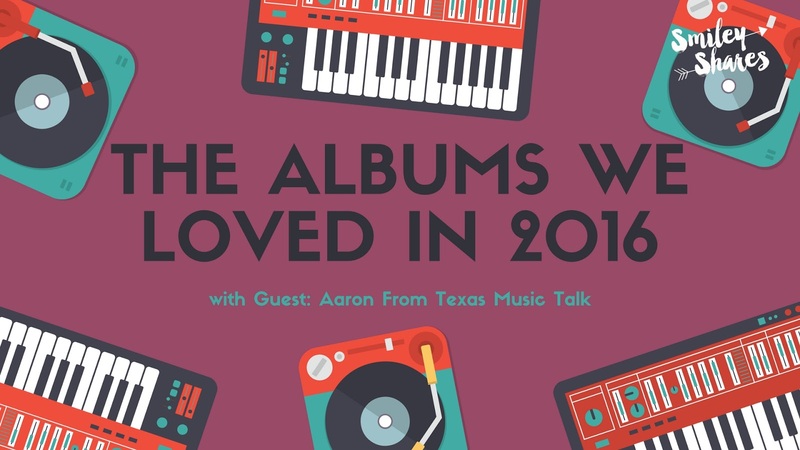 It is great to see that Baird’s decision to move back to Austin has definitely helped him define his music style, and given him that creative freedom to produce a stellar album. As yall know, I am a sucker for emotional songs that is probably why I quickly fell in love with “Wrong Side of the River”. Rob Baird, has a very smooth way of interpreting making the lyrics really connect with emotions of heartbreak, moments of reflection, and motivation to move forward during those moments of uncertainty. I know I am talking a lot about “emotions”, but this album is also fun and catchy, personally love being able to sign along to “Oklahoma” during my drives around town. I am excited to see what more good music Rob Baird is able to bring. several times, Austin Meade’s “Born with a Broken Heart” definitely stood out. I was able to connect with the lyrics of each song, from the beginning of “Born with a Broken Heart” to the end of “Written in Stone”. There really wasn’t a song that got me emotionally, but they made me reflect on past and current moments in my life, probably why it stood out. As a young artist, Austin shows great potential for growth in his music career. Hopefully being able to read through our perspectives of why each album means something to us, and being able to listen to a part of it will encourage you to give the full album a listen. Or maybe it won't, but whatever the case may be, we hope that 2017 is a year filled with good music, that makes you reflect, motivates you, inspires you, makes you cry, makes you laugh and makes you fall in love. Smiley and Aaron "Texas Music Talk"